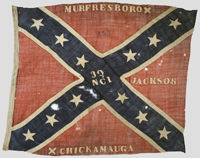 The 29th North Carolina was issued a Mobile Depot flag in 1864. Image shown is the flag of the 39th North Carolina. The colors of the 29th North Carolina would have been similar..